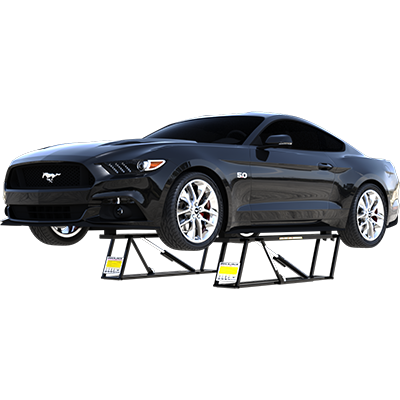 While the majority of vehicles can be safely lifted with one of our SLX models, some vehicles are simply longer—not necessarily heavier. Owners of these cars need look no further than the BL-5000EXT, an extended-length car lift that rolls and stows just like an SLX but offers 6 inches of extra reach. Also just like the SLX, durable rubber blocks slide along extended lift trays, and the entire system is backed by the same incredible safety certification as our other models. There's virtually no difference in operation or setup—all QuickJack lifts work the same! You'll find instant joy replacing floor jacks and stands with something that sets up in about a minute, lifts in about 30 seconds and offers a safer work environment than those old stands ever could. There are differences between the SLX and EXT models, however. A standard BL-5000SLX or BL-7000SLX offers a 60" lift point spread, while an EXT increases that reach to 66". Professionals will rejoice over this model as much as DIY'ers, because there's finally a way to get longer cars in the air when your other lifts are busy, or there's no room in the bay for a full-size lift. Plus, no bigger car lift can boast a stow-to-go operation time in 60 seconds (or even less)! Perfect for paint booths, quick-lube stops and those who perform full wheel service on a daily basis. An EXT QuickJack model may not be appropriate for smaller vehicles, given the 75" overall length of the BL-5000EXT. But since there hasn't been a low-profile, fully electric-hydraulic, completely open-center portable lift that fits longer wheelbases—until now—it's an incredible replacement for jacks and stands in almost any situation.